On the eve of the International Women’s Day, March 08, 2016, we successfully completed our first ever crowd-funded Women’s Project focused on ‘Financial Wellness for Young Women in Semi-Rural Region’. We so much enjoyed planning, designing and executing the project. This project is very close to our hearts and is one of the most satisfying and gratifying moments in our life. Life & Money primarily focuses on conducting holistic financial and wellness programs through onsite workshops by empowering participants to live their dreams and lead a healthy, wealthy and happy life. The workshops are designed to help participants understand the role of financial wellness in their lives, build smart money management techniques and develop basic personal financial planning skills. Over the last few years, we have conducted over 60 workshop sessions across corporate, colleges and direct to customers reaching out to around 2000 people across India. The idea for reaching out to young women exclusively in rural areas took shape while discussing our goals and action plan in January 2015 for the financial year 2015-16 . We wanted to launch a pilot project in one semi-rural area and if the project outcome is favorable we can expand to reach out to more young women across India soon. We decided to raise funds for the project through a crowdfunding platform. We raised enough money to reach out to 500 women in Tumkur District, Karnataka. The profile of the women who attended our programs are students from the final year of the undergraduate program from 7 different colleges in Tumkur District, whose parent/s are farmers with marginal land, self-employed or employed with most of the families earning average income of Rs. 2-3 lakhs per annum. I heard some of the women travel by bus for more than 4-5 hours every day [home to college and back]! What a determination to succeed in life! We began the first session of our workshop on 20th January 2016 and completed it on March 05, 2016 through two phases. The participation from students was electrifying! I have never ever seen so much of eagerness and hunger to learn, focus, wisdom, integrity and caring for others. I must say the best of the workshops are the ones we did for these wonderful women! I will like to share few inspiring stories to highlight how our program impacted the participants and us! During our first workshop, within minutes of beginning of the session, one of the participants, Rupali* asked me a set of very interesting questions. Why are we doing this program? Why only women? How will this project help all of us? I liked her curiosity and the hunger to learn the why, how and what [ now made famous by Simon Sinek] of launching a business or project. I was so glad that she asked this question because this will not only help her but also her batchmates in the workshop. I opened up our crowdfunding website for reference and answered her questions in detail one at a time. Once I finished, she summed it up so beautifully with a spark in her eyes, ‘ Now I know, If I have to launch a business – be it a product or service, I can choose to raise money through crowdfunding. I need not depend on my parents or husband [ in the future] or even a bank! Wow! It brought me tears of joy that this woman and others ‘get it’. One of the most important part of our workshop is to guide the participants to draw their personal and financial goals for short term, medium and long term. We then take them through a live interactive collaborative financial planning tool to find out how much they need to save and invest to achieve their goals. During the 3rd workshop session, one of the participants, Monali* mentioned that she wanted to buy a sedan car costing Rs.9 lakh in the next 3 years. We went through the collaborative financial planning process using the Goal Readiness Tool app and I guided her through few real life scenarios/events to make informed choices to arrive at few assumptions, expectations of income, expenses, budgeting for the goal, other goals, time horizon, etc. We re-worked the calculations and found out that she can achieve her goal comfortably! Her batchmates were happy too! One thing that Monali was very clear about was that she wanted to save and buy the car! No loans for her! Wow! I became curious and wanted to know more about her career goal too. Monali mentioned that she aims to compete for Indian Police Service [IPS] and become a Police Officer. She is already working hard at it. I asked her ‘ Why’. She said, “ There is so much injustice to the common man and criminality in the society. I want to play a part in changing the system for better”. I was speechless and at the same time felt happy for her purpose, grit and determination to serve the society better. We congratulated and cheered her ! And then I said softly, ‘ Monali..The Government of India will anyway provide you with the car once you join as an IPS officer. Will you still need to buy this car? You can probably save the money for some other goal’. She said, ‘ The car is not for me. It is for my parents. They have sacrificed so much of their lives to bring me up. Till date, they have been going in crowded buses and trains and I know for most part of their journey they would not have got a seat to sit comfortably and reach the destination. I want to give them the comfort and convenience to travel anywhere, feel fresh and better’. I was moved to tears…. On another day, a participant, Sonali* mentioned her desire to save for Retirement Corpus! Without batting an eyelid, she mentioned that she wanted to save Rs. 9 Crores for her retirement! I thought this was wonderful since we hardly come across young people who are just turning 20 or in their early 20s talk about retirement leave alone saving money for it. And to top it all a huge sum! As usual we went through the collaborative financial planning process using the Retirement Tool app and I guided her through few real life scenarios/events to make informed choices to arrive at few assumptions, expectations of income, expenses, etc and within sometime we arrived at a roadmap for achieving her Retirement Corpus. What I loved about Sonali is her meticulousness to budgeting for her expenses, income forecast, asset purchase price, needs vs wants clarity, goal clarity and debt management. She absolutely stunned all of us with her Retirement Planning Strategy by achieving her Goal! I have never seen a young woman with so much confidence, clarity of thought and purpose in life! Many participants also wanted to serve the community in the future with purpose by either starting a for profit business or not for profit business. Another interesting insight from the workshop was that ‘Rural people are no different from Urban people’ when it comes to grasping concepts and framework for learning and application in daily lives. Before beginning our workshops at Tumkur, we reviewed our Curriculum Design. Our area of concern was ‘ Do we need to change the curriculum’ for the rural audience? We debated on A. ‘Will there be a language barrier’ if I speak in English with participants B. Will participants be able to grasp some of the ideas and concepts of financial planning and money management which are explained through few inspiring English videos with American Accent. Because, we wanted to make sure that the participants understand our curriculum well and the outcomes are in alignment with their expectations. We arrived at a consensus [ based on certain scientific evidence and studies] that we will not change anything for the project. This was totally against the commonly held beliefs that we will need to speak the local language and tweak a number of concepts for the rural audience. Before we played the videos, we requested the participants to listen intently and note down the key points so that we can have a discussion on what were the key insights or pointers that they learnt from the video. What do you think would have been the response of the participants while watching the video as well the conversations we had after watching the video? Yes! The participants listened to each and every word with intent [ by living in the present moment] and gave amazing insights and pointers as to what they learnt from the video!!! Yes! Language is never a barrier. We all assume that when someone is not able to speak or write a particular language fluently, it will be hard for them to understand the spoken language as well. I was so amazed to watch these wonderful young women watching with intent and coming up with awesome insights and learning agility [ never come across among urban youth till date]. This truly indicates that the young people of rural India are eager and hungry to learn, grasp quickly, have greater wisdom [ thanks to less information overload?] and perseverance to create a bright future for themselves and their families. I am so enamoured by the rural population’s potential to change their and their families lives for better and the world. All we need to do is to support them with tools and resources, be a ‘ Choice Architect’ and gently ‘nudge’ them to live their dreams. We are absolutely inspired and motivated to reach out to more rural young women of India from this year onwards! We have been working on some interesting ideas and some incredible plans are on the anvil to reach out and empower a million young women on financial wellness by 2020 in rural India. If you are a Corporate firm and if this project speaks to you and touches your heart, we would love to collaborate with you. You can reach out to us at partha@yourlifeandmoney.com. 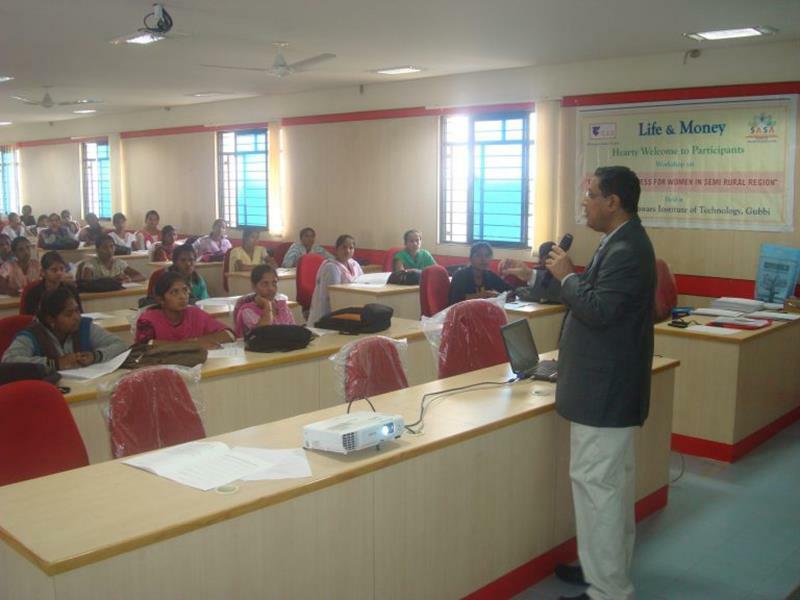 0 responses on "Empowering Young Rural Women on Financial Wellness"